Your Specifications. Our Expertise. On Time. We are excited to announce that Michael was selected as a Business West 40 Under Forty recipient in 2009! 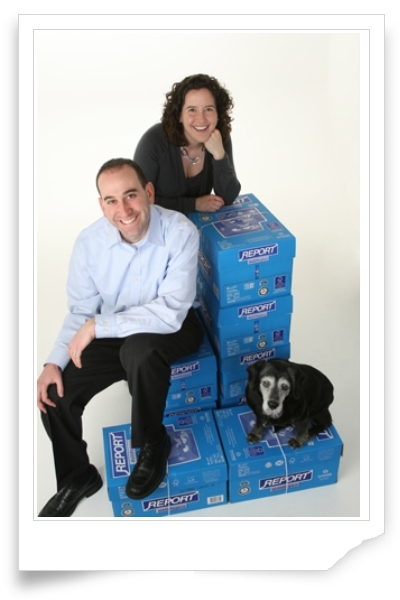 Michael wanted to include Lindsey and Weezy in his photo because they work as a team and represent what our customers have come to identify as the Minuteman Press family. Age 29: Owner, Minuteman Press Michael Weber knows a secret about how to succeed in business. The formula has worked – the Webers have increased sales by 450% in the five years since they purchased the business. Weber takes his volunteer work seriously. He is vice president of the North Central Connecticut Chamber of Commerce, a director of the Young Professionals Society of Greater Springfield, and a member of the Home Builders Assoc. of Western Mass. and the Affliliated Chambers of Commerce of Greater Springfield. He joined these organizations immediately after moving from Boston to Connecticut and taking over the Minuteman franchise. His motivation was to make friends, make a difference, and form relationships that would result in business accounts. Although his approach has worked, Weber’s intent is always focused on the greater good. “I want to do my part by helping people out and genuinely contributing,” he said, adding that he has supported beneficial initiatives even when they were not good for his business. Many of his volunteer activities involve working with people who are much older, so Weber especially enjoys his affiliation with the YPS. “It’s refreshing to be on board with so many like-minded people. I truly have good intentions and try to contribute,” he said. Minuteman Press is a commercial printing company providing print, promotional products, and custom apparel. Copyright © by Minuteman Press. All rights reserved.